Tonight I tried another clean eating recipe and this one was really yummy! It’s another Clean Eating Magazine recipe. It was absolutely delicious! Mike added in some sautéed mushrooms and love it as well! I even liked the wheat pasta, which to date I have hated. Enjoy! To boiling water, add pasta and cook al dente according to package directions. Before draining pasta, ladle about 1/2 cup cooking water into a heat-proof measuring cup and set aside. 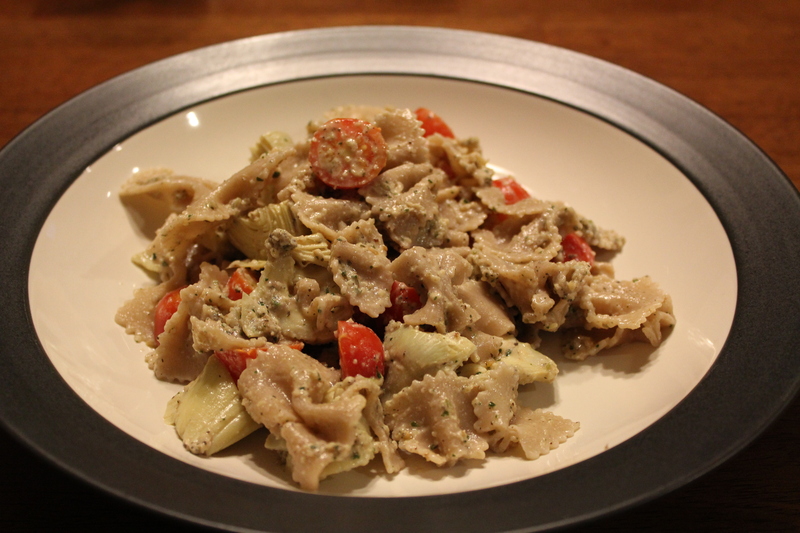 Return drained pasta to pot and add tomatoes, artichokes and pesto. Place on low heat and stir to combine. If more moisture is desired, add reserved pasta cooking water 1 tbsp at a time to achieve desired texture. Heat until vegetables are heated through, about 2 minutes. Season with salt and additional pepper.